Excitement is in the air and if your children are anything like the Lil Divas they can not wait for Christmas to arrive. The anticipation for such a fabulous day can get overwhelming so to keep things fun, active and full of family time 24 bloggers from around the world (including yours truly!) 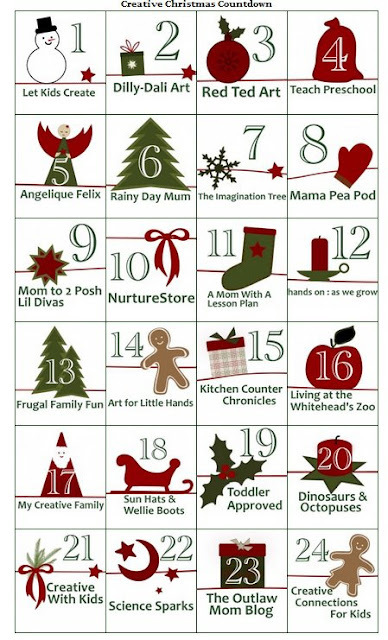 have joined together to bring you an amazing 24 Days of Holiday Magic Virtual Advent Calendar! Here are the 24 participating bloggers - the numbers correspond to their days (for example I am number 9 on the list & my day is on Dec 9th!) and there will be an array of wonderful activities from the sharing of special traditions, making ornaments and gifts, yummy goodies to eat and lots of ways to spend fun time together. Be sure to visit each day from 12/1-12/24 and click the Calendar Button above or the corresponding blog links provided here to find out the special activity each blogger has chosen to share with you on that day. We hope you join us in this special celebration of Christmas and family and maybe even start a few new traditions of your own along the way.